Handpicking presidential successors in a bid to manipulate them rarely works. -Look at what is happening in Botswana. Ian Khama is regretting. When Mokgweetsi Masisi was sworn in as Botswana’s president earlier this year, everyone expected him to toe the line. He was handpicked by outgoing president Ian Khama, who ran the country for two constitutional terms with an iron fist amid rising cronyism and corruption. But Masisi has made changes that were unthinkable a year ago, steadily pushing the hands of the Khama clan away from the levers of power. Khama’s controversial security chief, Isaac Kgosi, was the first ally to be sacked. “He served this country with distinction for 40 years” was Khama’s angry reaction. Kgosi, Khama’s batman when he was Botswana Defence Force chief, also faces corruption charges. Significantly, the outburst was made to the privately owned The Voice after Masisi’s administration refused to allow Khama to re-employ Kgosi as his private secretary. Khama no longer enjoys unfettered access to the state-controlled media. As president, Khama disdained the private media, describing it as “shallow, boring … never contributing anything”, unpatriotic and partisan. Masisi also reshuffled the Cabinet, sacking several ministers and redeploying others, and shook up the civil service. Mineral Resources, Green Technology and Energy Security Minister Sadique Kebonang, linked with Kgosi to a graft scandal in the National Petroleum Fund, was dropped. Minister of Land Management, Water and Sanitation Services Prince Maele, a Khama loyalist, did not make the cut. The government recalled Roy Blackbeard, Botswana’s “ambassador for life” in London, who had resigned as an MP to make way for Khama in 1998. Masisi dodged questions about tensions with his predecessor. Then in a televised State of the Nation address, he admitted relations were so bad that he had asked former president Festus Mogae and other ruling party elders to mediate between them. Khama was not amused, saying in a press statement that he was made to seem “the one at fault”. In part, Masisi is reacting to the worsening governance standards that occurred under Khama’s watch. A corruption perception report by Transparency International suggests a slip from 2008 to 2017. Botswana is now fifth in the Ibrahim Index of Governance in Africa, down from second in 2014. Masisi told the Sunday Standard, while he was vice-president, that there were plans to sack him. The flashpoint, he said, was his refusal of Khama’s request for the appointment of his younger brother, Tourism Minister Tshekedi Khama, as vice-president. 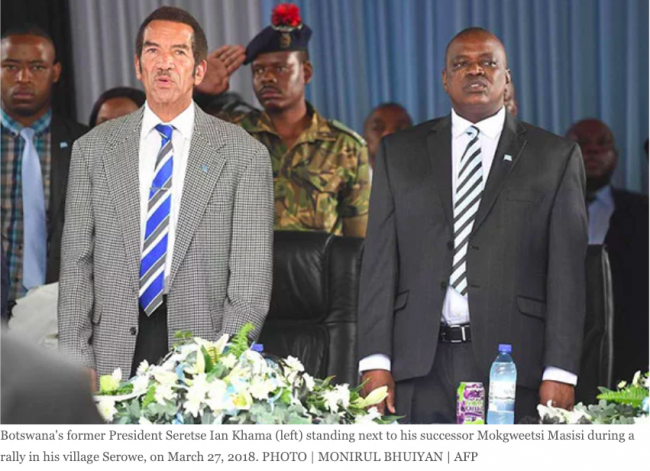 Khama complains that Masisi has reneged on agreements, but refuses to elaborate. There has also been conflict over Khama’s legal entitlements as former head of state. One issue was his request to continue flying in military aircraft. Masisi said use of military planes was not a right of former presidents. In October, the government withdrew five members of Khama’s support staff, prompting his bitter complaint that the situation was getting out of hand and needed “legal intervention”. The government reinstated the officers, and Masisi apologised and affirmed his acceptance of the Former Presidents’ Pensions and Retirement Benefits Act. Masisi has also started to roll back Khama’s policy legacy. For example, he has opened doors for dialogue with trade unions and the media. Khama shocked many with his pronouncement that he still considers himself president of the ruling Botswana Democratic Party (BDP). Party secretary general Mpho Balopi insists that Masisi now leads it. The BDP constitution states that “the president designate … [becomes] the party president upon the predecessor lawfully vacating that position”. Khama’s family has significant economic power, mainly in Botswana’s strategic ecotourism business. Tshekedi’s appointment to the tourism portfolio was perceived as a move to safeguard the family’s interests. Ian Khama has a stake in Linyanti Investments, which owns the 1 300km2 Linyanti Concession in the Okavango Delta. Khama’s lawyer, Parks Tafa, chaired the board of Wilderness Holdings, the parent of premier ecotourism company Wilderness Safaris, for most of Khama’s presidency, and Marcus ter Haar, Khama’s nephew, is a nonexecutive board member. The recent allegation of an elephant massacre may have its roots in the leadership struggle. Masisi’s government drew fierce criticism from international conservation groups after claims that 90 elephants had been poached. Thea Khama, Tshekedi’s wife, publicly blamed it on Masisi’s disarmament of the anti-poaching unit. But doubt was cast on the claims when the government took journalists on a tour that revealed 19 elephant carcasses. According to the National Anti-Poaching Committee, only six were victims of poaching.